It’s a Rembrandt self-portrait! No, it’s a Rubens self-portrait! 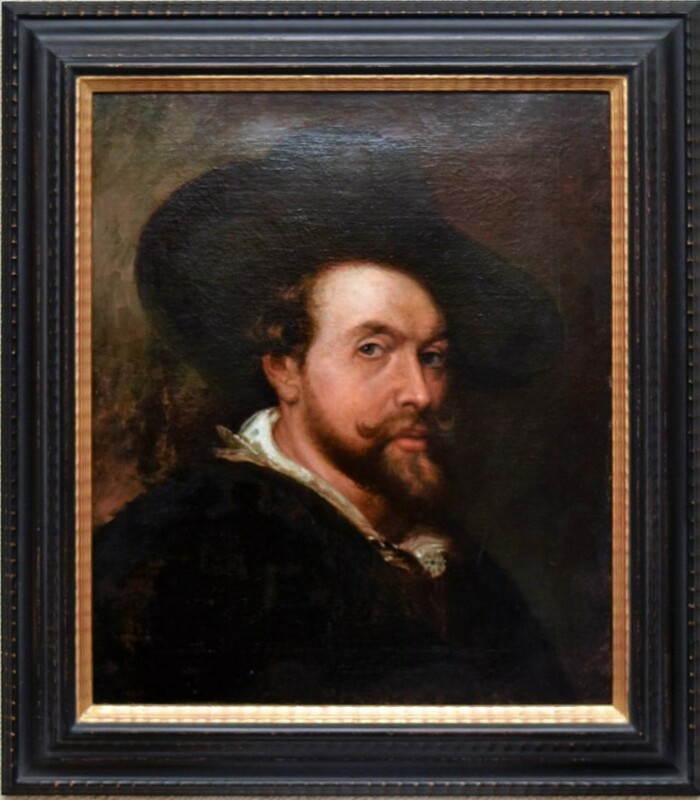 Sir Peter Paul Rubens (1577-1640) was a Flemish draftsman and painter and is widely considered the most notable artist of the Flemish Baroque art school. So it’s always newsworthy when a work by Rubens presents itself at auction. And this circa-1620 self-portrait will be sold on Day 3 of Eden Fine Antiques Galleries’ Spring Fine Arts, Antique & Estate Auction slated for April 14-16, online and at the firm’s gallery in Marietta, Georgia, outside Atlanta. At press time, someone had already met the starting bid of $250,000. 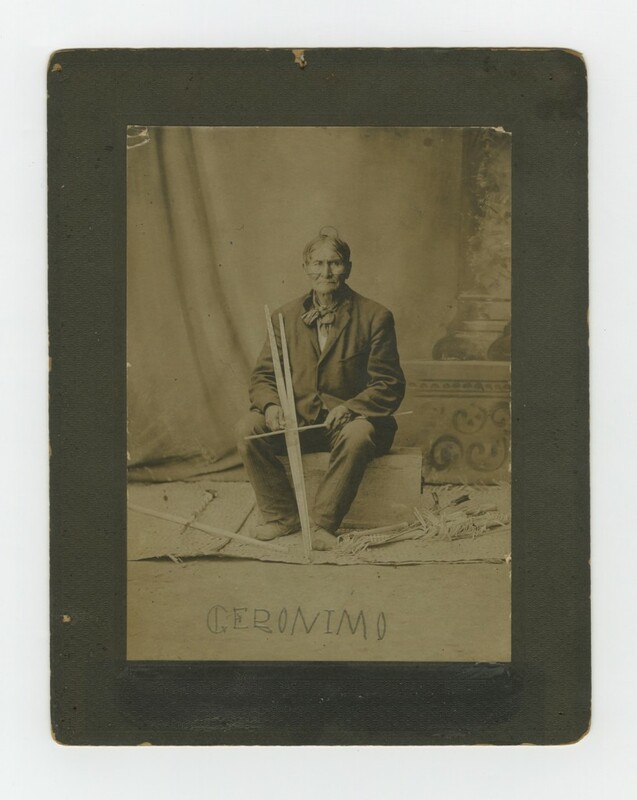 One of the more glamorous lots in a glamor-filled online-only auction slated for Tuesday, April 11th, by University Archives in Westport, Conn., is this monochromatic 5 inch by 7 inch cabinet photo, signed by Geronimo (1829-1909), the legendary Native American leader from the Bedonkohe band of the Chiricahua Apache tribe. It’s one of only a few photos ever signed by Geronimo extant, and it carries a pre-sale estimate of $15,000-$20,000. It was consigned by the great-great-grandchild of the photo’s original 1904 owner. Other top lots in the auction will include a rare letter written and signed by James A. Garfield while he was serving as President; an equally scarce Order #9 signed by Confederate Gen. Robert E. Lee, stating a farewell to his troops at the end of the Civil War, expected to bring $100,000 or more; a first-edition copy of The Catcher in the Rye, signed by author and famous recluse J. D. Salinger, regarded as a Holy Grail item in literature; a Benjamin Franklin document; and several items pertaining to President Abraham Lincoln. 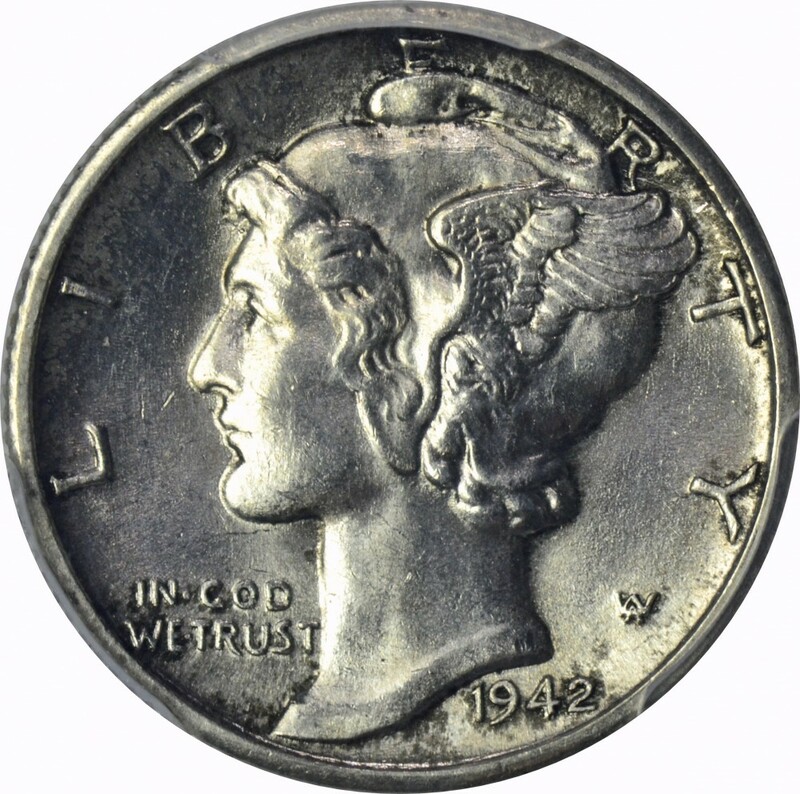 Serious collectors of Mercury dimes, minted between 1916 and 1945, are familiar with two key dates: the 1942 over 1941 error strike and the 1916-D, the latter of which only 264,000 were produced. Examples of both will be in Capitol Coin Auctions’ April 9th sale, online and at the Hadi Shrine Temple in Evansville, Indiana (where Capitol Coin Auctions is based). The 1942 over ’41 dime was the result of an accidental switching of dies at the US Mint. The coin is very popular with collectors because of its unusual appearance. The 1916-D (Denver mint) is just flat-out rare (264,000 is a minuscule figure for a coin mintage). The one in the sale is a gorgeous example, graded PCGS MS62, full bands. The ’42 over ’41 carries an even higher grade – MS63 – full bands. Also sold will be nine 1909-S VDB Lincoln head pennies, a great group of pre-1965 Washington quarters and high-grade Walking Liberty halves; and a rare, 14kt gold (nearly 2 oz.) U.S. Department of the Interior Distinguished Service Medal from 1949, just the second year of issue. Find out more and submit here to Capitol Coin Auctions. A monumental triple gourd vase once purchased by the iconic American financier John Pierpoint Morgan will be sold as part of Heritage Auctions’ inaugural Asian Art Signature Auction slated for Saturday, April 2nd, online and at the firm’s gallery in Dallas, Texas. Morgan was an active patron of the arts and amassed one of the finest and largest Asian art collections in the world. The beautiful, 3 ½-foot-tall vase is a two-piece construction and carries the Morgan Collection labels on the underside and interior neck. The Chinese blue and white triple gourd vase is estimated to sell for $30,000-$50,000. It features floral foliate motifs on the upper baluster segment, dragons, leaves and blossoms in the midsection, with chrysanthemums and dragons on the lowest portion – a Kangxi masterwork of pottery and painting. The auction will also feature a hanging scroll by Zhang Daqian, titled Plum Blossoms, from 1972 (est. $50,000-$80,000); and a fine pair of Japanese parcel gilt and patinated bronze vases, Meijing period (est. $30,000-$50,000). 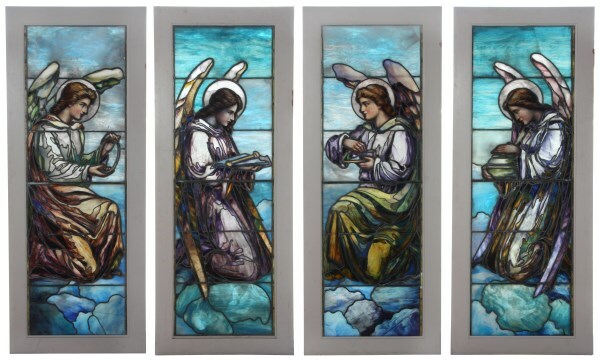 One of the projected top achievers in Fontaine’s Auction Gallery’s Antiques & Fine Art Auction on Saturday, April 22nd, is an exquisite set of four leaded stained glass windows, made circa 1910 by J & R Lamb, each one measuring 72 inches tall by 23 inches wide. The set has an estimate of $12,000-$15,000. J & R Lamb is America’s oldest continuously run decorative arts company, older than even John LaFarge or Tiffany. The firm was started in 1857 in Greenwich Village, N.Y., by British-born brothers Joseph and Richard Lamb. The Lambs might never have come to the States except their father, a landscape architect, was recruited to work on Niblo’s Garden, an exhibition hall and open-air theater in Manhattan. At first, J & R Lamb made stained glass, and also mosaics, murals and monuments for churches, temples, residences, government and academic institutions. When the firm was picked by the US government to display American excellence in stained glass at the Paris International Exposition of 1900, it became internationally famous for its stained glass work.